There we have it. Not the actual machine I owned but one very similar. 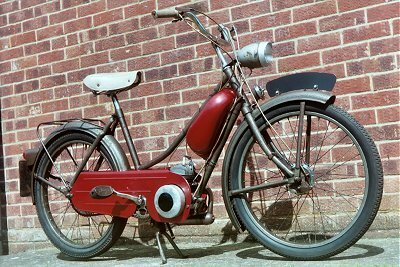 This started out as my father's moped, and when we moved house back in around 1964 the Panda moved with us. It then stayed happily in the shed until my father dragged the thing out and managed to get it running. Thus started my love of bikes. This little thing taught me how to use a clutch - it had a three inch clutch, no gears, just a clutch. The engine was later removed and I used to pedal around the streets on the rolling chassis. The engine later found its way into a D1 Bantam frame, and the "Pandemonium" was born. A machine so under powered and over geared that is would only move either on the flat or downhill, any sign of a slope and the whole plot would stop. Y'know I can't remember what happened to it - maybe that's for the best.